Many of you who read this blog are great fans of origami. 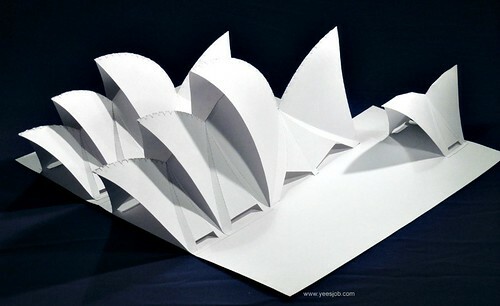 Perhaps then, you're familiar with master paper crafter Sheung Yee Shing (better known as Yee) and his 2011 book Origami Architecture: Papercraft Models of the World's Most Famous Buildings that contains instructions and templates for creating sixteen paper models of iconic structures. Earlier this month Tuttle Publishing released Yee's Origami Architecture Kit that makes creating his structures even easier. Card stock punch outs are provided for the three beautiful models you see here... the Eiffel Tower, White House, and Sydney Opera House. Each would make a wonderful conversation piece to place on your office desk or coffee table. Yee even designed the models to fold flat if you'd like to store or easily send your handiwork through the mail. Having the 20 sheets of templates already prepared means getting to the fun construction part that much faster. Only a few supplies are required... glue, burnishing tool, craft knife, cutting mat, and toothpicks. Oh, and don't let the term origami scare you off... there is little actual folding (or cutting) required, except along pre-scored lines. Valley fold and mountain folds... yes, you'll need to understand those simple concepts, but they are clearly explained in the accompanying booklet. Yee also provides general paper crafting tips, as well as step-by-step photographs that show precisely how to build the models... follow the pictures and text instructions and you can't go wrong. I think teens and adults alike will enjoy this kit. You'll feel like an architect as you experience a structure taking shape beneath your fingertips! 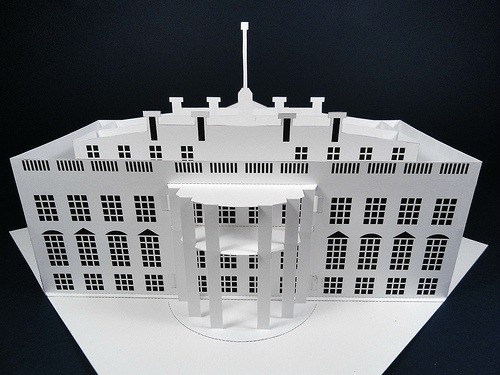 Keep in mind the finished models are relatively small... for example, the completed White House measures 9.37 inches (23.8 cm) x 9.09 (23.1) x 5.36 (13.6). 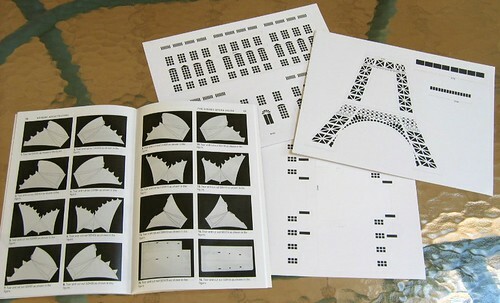 Tuttle Publishing sent an Origami Architecture Kit to me for review purposes and will send a kit to two U.S. residents. Leave a comment below as your entry. Be sure to include an email address or another way to be contacted within your comment. The giveaway will end on Sunday, November 3, 2013. I will announce the randomly selected winners on this post after they have been contacted. Congratulations to the winners - dtran36 and Jane S! Wow it looks like it would be complicated! But oh so gorgeous! 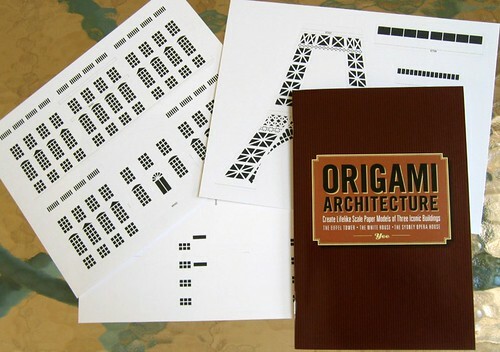 This looks like an excellent gift to give an architecture student for the Christmas season! This is fantastic. All the hard work of cutting out is done. This would make an awesome gift do my son-in-law. He loves puzzles and architecture. e're up to the challenge! Oh this is great! 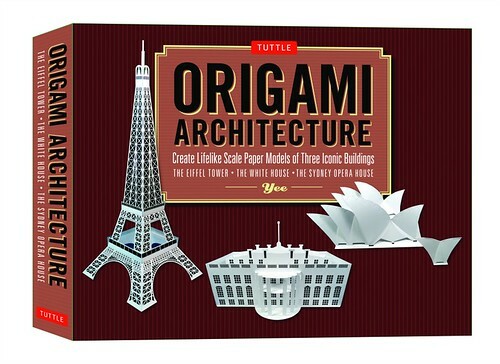 Will have to get a copy for my husband because he is an Architect and loves origami! It really looks like a cool book. Yee is a master craftsman. I love his work. I would love to win a copy of his book. giveawayjean AT gmail dot com. 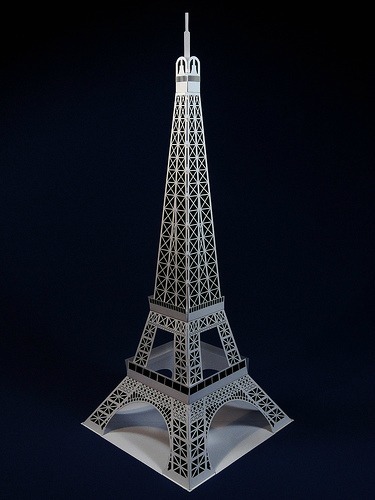 I love iris folding, but origami seems difficult to me....what a delight it would be to win this kit and be able to construct these wonderful buildings!!!! WOW! Gorgeous pieces--they look like grand fun to make. I like the idea of small sizes because I don't have much room to display things like this. Wow! How cool! Would love to win. rridgw@hotmail.com would love this as a gift for my son! I enjoy your paper blog! Yee is an exceptional Paper Architect & his books always make a great addition/gift for OA enthusiasts. wow! looks like a lot of fun . The giveaway has ended - thanks to all who entered! This is Julia from FaveCrafts - just wanted to stop by and say thanks so much for linking t our giveaway! So glad you could spread the word about this exciting promotion. Have a wonderful day! My pleasure, Julia! Thanks very much to FaveCrafts for writing such a positive review of the book and for offering the giveaway. It would be very valuable for my career to have a copy of this issue.